“People are freaking out, and I don’t blame them,” state Assemblymember Jo Anne Simon told the Brooklyn Eagle on Monday. As residents of Brooklyn Heights vacillate between outrage and panic, the city’s DOT has begun to analyze the feasibility of a plan put forth by community groups that might save the landmarked Promenade from being temporarily turned into a six-lane highway. No matter which plan the city eventually goes with, however, DOT says the Promenade is going to be out of commission for years, since the walkway is the inseparable top level of the BQE’s triple layer structure. DOT engineers have proposed routing a temporary BQE over the iconic Promenade while the triple-cantilever beneath is rebuilt. The idea, called the “innovative” plan by DOT, has shocked residents and businesses as it would bring the noise and pollution of 153,000 cars and trucks up to the level of neighborhood yards and streets. The Brooklyn Heights Association and local officials met with DOT on Nov. 18 to present their alternate proposal, which would route a temporary BQE over the eastern edge of Brooklyn Bridge Park, below the residential neighborhood. Some residents are holding out hope that the Promenade could emerge unscathed from the massive reconstruction. DOT said, however, that the walkway is integral to the BQE’s overall structure and it would likely have to be at least partially taken down. “The Promenade forms the top deck of the section of the BQE known as the ‘triple cantilever’ (between Orange and Remsen streets), which has unusual engineering characteristics — it is a ‘one of a kind’ structure,” the DOT spokesperson told the Eagle this week. “The three cantilevered decks are supported by a vertical wall that also serves to hold back the earth behind it. A complex system of forces holds up the cantilevered decks and soil, and moving one of its parts affects the others. Thus, the BQE cannot be fixed without affecting the Promenade,” the spokesperson said. The mayor revealed his backing for the “innovative” plan in October, enraging local residents and businesses who say he blindsided them and “short-circuited the community engagement process.” Soon after, however, Mayor Bill de Blasio said he would be willing to consider alternatives — as did DOT Commissioner Polly Trottenberg. “We are continuing to evaluate a variety of ways of addressing the structural deterioration of the entire BQE, including the Promenade. It is important to remember some of the same deterioration issues that exist at the roadway levels also exist at the promenade level and NYCDOT’s intent is to address all of them in the most prudent way possible,” DOT told the Eagle. But she pointed out that construction also causes air pollution. If the job were to proceed on a traditional lane-by-lane basis, another option DOT has considered, construction — and pollution — could last up to two years longer. Simon cited a 2012 study conducted by researchers at Lutheran Medical Center and SUNY Downstate Medical Center that found that living near a heavily congested highway correlates with a higher presence of asthma. The study, published in the Journal of Allergy and Clinical Immunology, reported higher rates of asthma among those living closer to the BQE (aka I-278), near a portion known as the Gowanus Expressway. Those living in the same community but farther from the Interstate had lower levels of hospital admissions. Until now, the Promenade has partially shielded neighborhood residents from this pollution, said Laurie Garrett, former senior fellow for global health at the Council on Foreign Relations in New York and Pulitzer Prize-winning author on global public health. “The Promenade overhang has, for decades, buffered both BQE noise pollution and actual CO, CH4, CO2, ozone, PM 2.5, lead, mercury and other pollutants, holding most of the horror beneath. Moving all traffic up to Promenade level will bring that noise [and] air pollution up to ear, nose, mouth level for local Brooklynites,” she commented in response to an article in New York Magazine by architecture critic Justin Davidson. In a letter to Brooklyn Heights neighbors, Garrett urged residents to prepare “EIS ammo,” referring to the required Environmental Impact Study. Simon, however, says she feels DOT is being open in their approach. The $3.4 billion BQE reconstruction is one of the most massive engineering feats the city has attempted since Robert Moses built the highway and its triple cantilever section in the late 1940s. 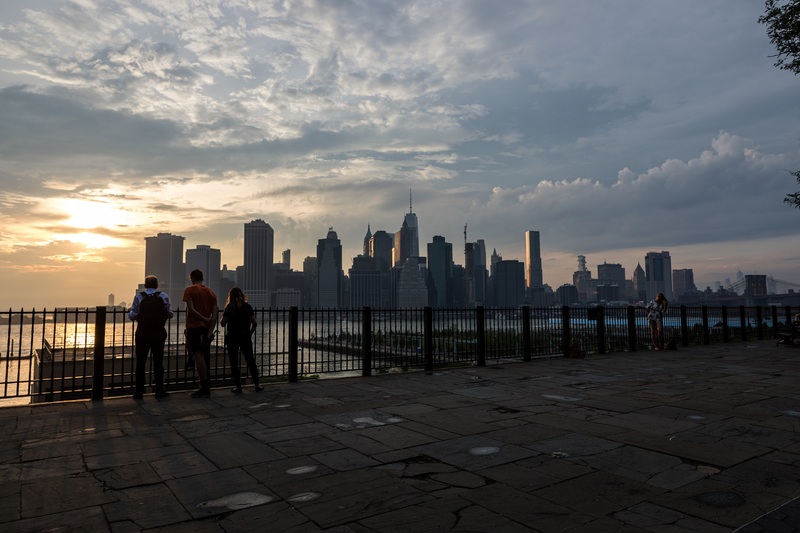 The Promenade is considered the jewel of Brooklyn Heights, attracting thousands of visitors. The structure, designed by landscape architect Michael Rapuano along with his partner Gilmore Clarke, is part of the neighborhood’s historic district and its landmarked views of the Statue of Liberty, Manhattan and the Brooklyn Bridge have received special designation. Based on Simon’s statement, our choices are between a less harmful or more harmful pollutants, both have shown to cause asthma, cardiovascular diseases, dementia, and premature death just to name a few (the list is long). But let’s double it up with vehicles on top and construction below for 6+ years day and night. Please explain how one can acknowledge the air pollution problem yet seem to be sympathetic to the DOT? I agree they have a tough job, but who should be held accountable for procrastinating and allowing the park’s development, now limiting the options for the repair. Why are tens and thousands of lives being put at high risk of having short-term and long-term health problems because the government didn’t take action? This is extremely irresponsible and honestly, immoral to prioritize lanes over our lungs. The people most susceptible to the health affects of air pollution are unborn babies and pregnant women (linked to adverse pregnancy and lower birth weight or preterm birth), children (not only their lungs are still developing, they are outside more and breaths faster than grown ups), Older adults (heart disease, stroke, lung disease, dementia), People already has asthma, lung disease, cardiovascular disease and cancers. There are 17,000+ people within 500 feet from the BQE from Congress to Sands, plus thousands more who come for school and work, many of which are government offices. We should not be building a larger taller highway to accommodate the trucks and cars. We must come up with a better way to move people and goods without increasing pollution or bringing the pollution literally right next to homes, schools, and playground. And for those who drive, did you know there are pollution absorbing bricks and tiles that exists. I didn’t see that in the DOT’s presentation? I didn’t see any mention of air pollution in the DOT’s BQE presentation. How is that possible? Yes, the road has to be fixed and improved, but how it’s done matters. According to the latest climate report, if we don’t take drastic measures, these structures will not last through the extreme weather. Furman street may be under water, and all this will be pointless, people will be sick, and tax dollars wasted. We need think outside the lanes. We must do better. I suspect by the time the reconstruction is done, the vast majority of commercial trucks and a great number of the cars will be electric. The construction is temporary, the negative impact on human lives can be permanent. I suspect that “by the time the reconstruction is done” you and I and many of our neighbors will be gone. Aarrrrimapirate, BHA has someone working on a presentable design but it is still unavailable. They project they’ll have something out mid-January. I agree with Joan Simon’s conclusion that the entire roadway must be deflected to ground level during construction. But it may be possible for the promenade…which is 1/3 of a mile long… to be done in sections. That way at least portions of it might be accessible during the time of total reconstruction for the two traffic roadways below. The DOT estimates that trucks will not be able to use the BQE under the Promenade in 8 years, based on 153,000 cars and trucks using that roadway each day. If the number of vehicles using that roadway is deceased the roadway will be usable for an extended period of time; and the project will NOT be in an “Emergency-must be done Now and with the 6 lane highway on top of the Promenade”. Taking the tolls off the Brooklyn-Battery Tunnel will immediately reduce the traffic under the Promenade, extending the life of the roadway under the Promenade, And there are other solutions to reducing the traffic under the Promenade, allowing for less dramatic solutions which will not destroy Brooklyn Heights. What about putting back the tolls on the Brooklyn bound Verazzano? Just look at the photo that headlines this story. alternate route for BQE traffic to Save the Promenade. Walk down to the Promenade and look down. It couldn’t be more obvious. It’s unfortunate that the city has started with such limited and narrow options. It’s one form of traffic and pollution or another. In more enlightened cities (whether Seattle or Oslo), they bury the roadway underground. That should be the leading option here. If there’s a will, the money will be found. 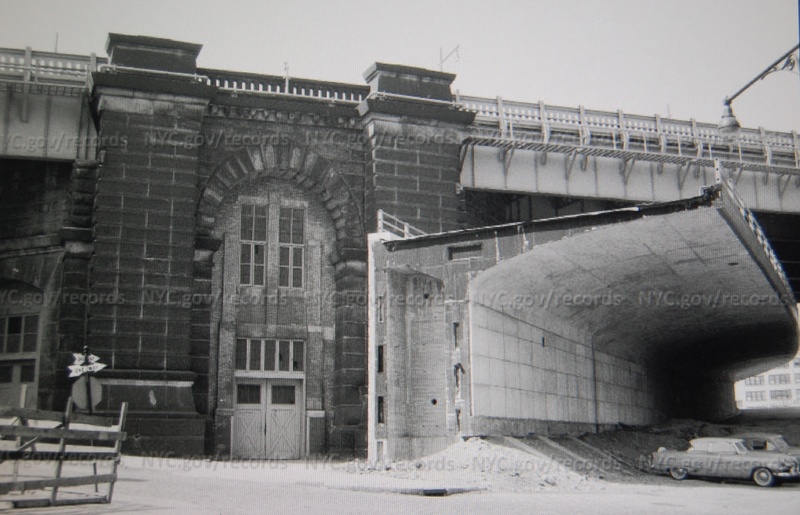 won’t they hold a town hall explaining tunneling in Brooklyn? I can see how the promenade would need to be closed during construction – that makes sense because the whole structure needs to be torn down. But it also means there is no promenade structure for a temporary highway – all six lanes would have to be another level up, on an expensive temporary structure, which is insane. I think that whole plan must be some kind of diversion. Has DOT even produced any kind of technical drawing showing how they think that would work? The idea of routing a temporary highway through Brooklyn Bridge Park is better, but realistically I don’t think there is enough room there for the highway plus the room needed for construction. The only way to get this project done efficiently is to shut down that section of the BQE entirely. The project would get done cheaper and much more quickly. The traffic will find another path, as it always does.